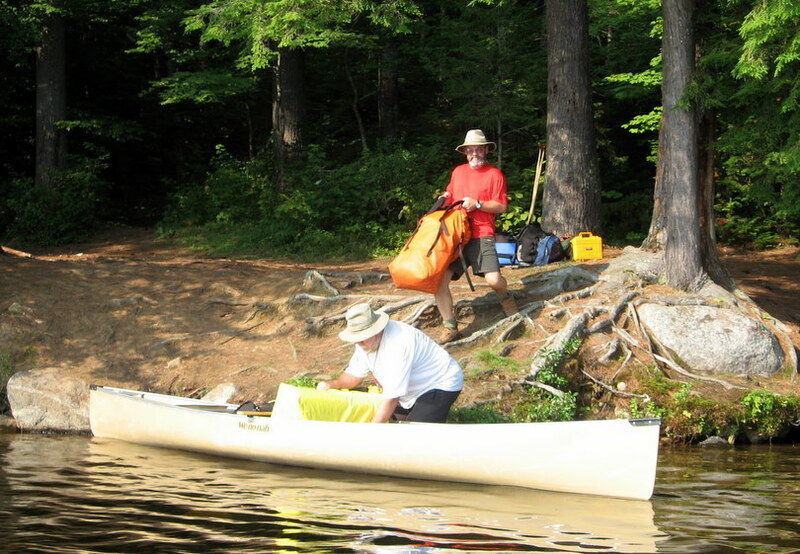 On Sunday 16 August Kathryn, Eric, Skip, Bob & I embarked on a tour of the St Regis Canoe Area via the 11 Carries Route. The 7 Carries and 9 Carries Routes are popular ways to tour through Fish Pond. We lengthened the trip and did it counter clockwise by leaving from Upper St Regis Lake on Sunday afternoon. Our plan was to be arriving as other campers were leaving from their weekend trips, but frankly we didn’t see a tremendous difference in attendance. I have read various theories; including that the early summer (July) was so rainy that many people postponed their camping trips until later in the summer. As mid-August approached they decided to get out camping. We had a similar approach two weeks prior at Lake Lila; coming in on Sunday afternoon; and although not all sites were occupied we certainly didn’t have the lake to ourselves. We set up our car shuttle by returning one car to Long Pond (far lower left) and were paddling across Upper St Regis by 2:30pm. 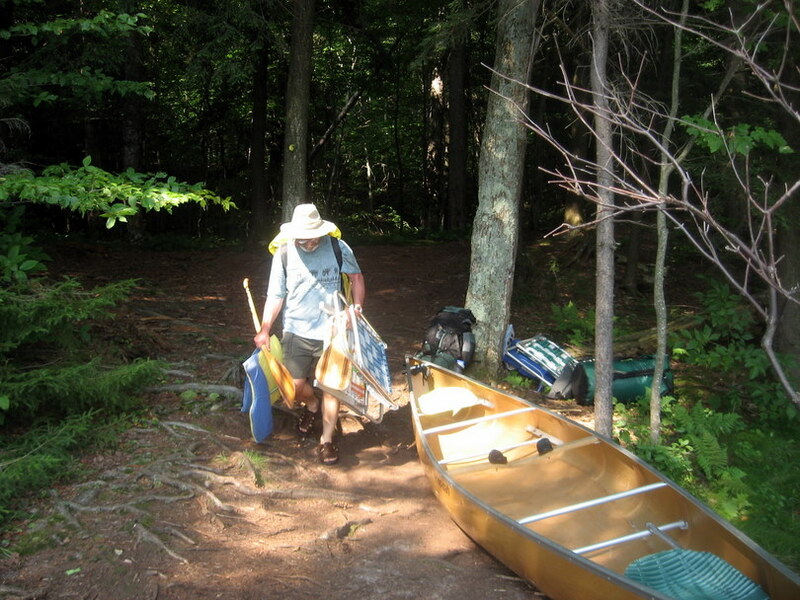 We quickly crossed Upper St Regis and made the 150′ portage into Bog Pond. We had pre-determined this would be a leisurely trip. In other words we were going to bring comfort items (chairs, books, backpacker’s oven, etc) and hopefully spend some time relaxing in camp – perhaps even stay two days in the same place. This meant that we would double carry each portage. Below Skip completes the 2nd carry of an early portage. As the trip wore on we consumed drinks and food and packed more efficiently such that not everyone had to double portage. Usually everyone made one carry, including Eric who carried his knapsack and three canoe paddles, and three people returned for a 2nd load. We took my kevlar MN II (43 lbs) and fiberglass Jensen (54 lbs). I fit a clamp-on portage yoke onto the Jensen, but it was never really comfortable. We all took turns carrying this boat, but Bob & Skip carried the Jensen the most. Below Bob demonstrates his technique as I follow with a 2nd load. From Bog Pond we did another 150′ portage into Bear Pond; crossed Bear Pond and portaged the 1/4 mile into Little Long Pond where we made camp for the 1st night. Our tent sites were up the hill in the woods, but our kitchen and living space was down near the water where we had an excellent view. We were concerned about mosquitoes, but were never really bothered by bugs. Kathryn attributed the lack of bugs to her diligence attending to her bug lamp. Below Eric relaxes in the evening sun after a long swim in the lake. 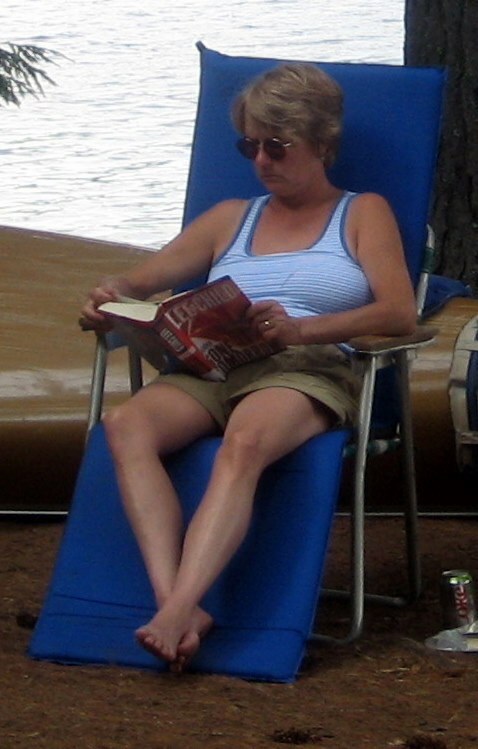 Kathryn relaxed in her lawn chair reading and watching for birds. Despite being somewhat bulky the aluminum lawn chairs are light and offer supreme comfort (and back support) in camp. We were rewarded by seeing and hearing loons on every water body. At night we not only heard loons but also Barred Owls (Who, Who cooks for you?). The 2nd day we left Little Long Pond, portaged 1/4 mile to Green Pond and then portaged 100′ into St Regis Pond where we came upon a lean to site shortly after it was vacated. 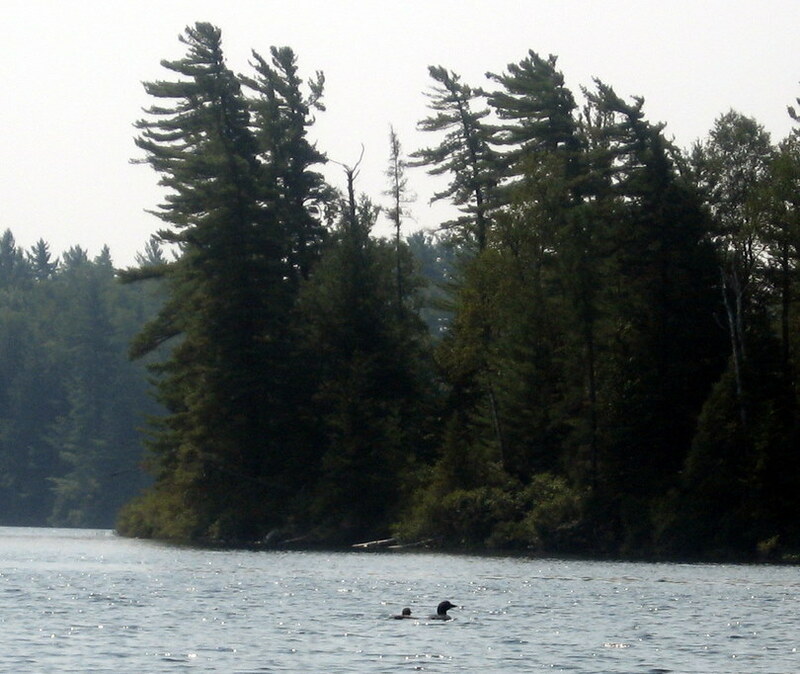 We saw a solo canoe paddling along the edge of the lake and believe he just left the lean-to site. Eric was enamored with the lean-to, having never stayed in one before. It gave him a clean flat surface to play with his Legos and lots of left items to experiment with. Other than the curious chipmunk and normal ‘lets leave stuff at the lean-to for others’ it was a pretty nice site. Kathryn and Eric went for a long 40 minute swim while we organized our gear. Throughout the trip we had constantly sunny, hot days that made swimming a refreshing activity we enjoyed each afternoon. Skip relaxed and worked on his ideal 10 team volleyball schedule. In the evening Eric and I took the canoe out for a little paddle. 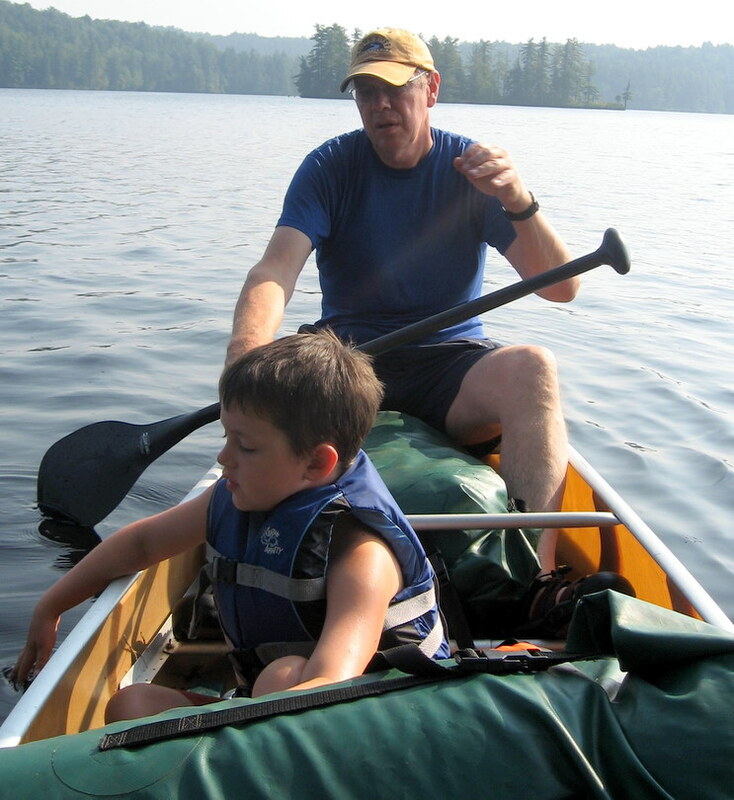 Eric has his own junior-sized bent shaft paddle now and is getting more adept at paddling. He still paddles primarily on one side, but that’s OK. 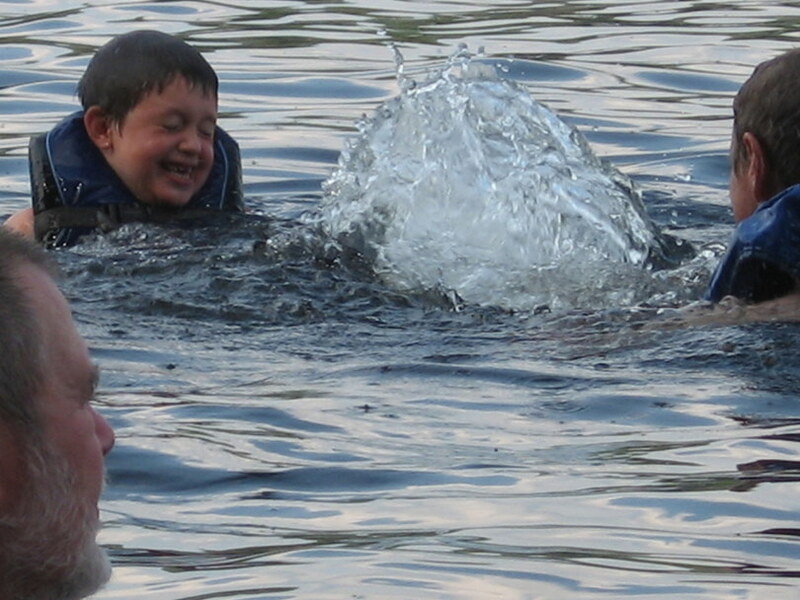 The hot weather encouraged another swim by Bob, Eric and myself, which broke down into water splashing games. 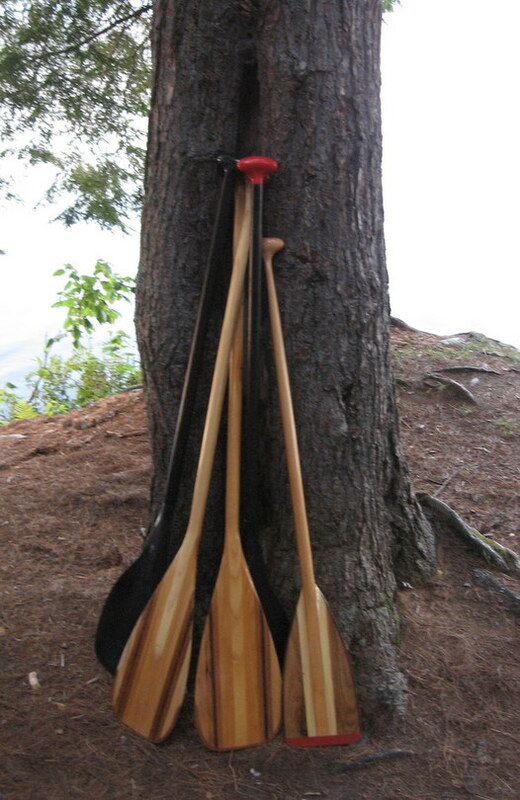 The additional time encouraged us to try some artsy photos such as the paddles leaning against the tree. The next day we loaded up bound for Fish Pond. It was a short paddle up St Regis Lake into the outlet. 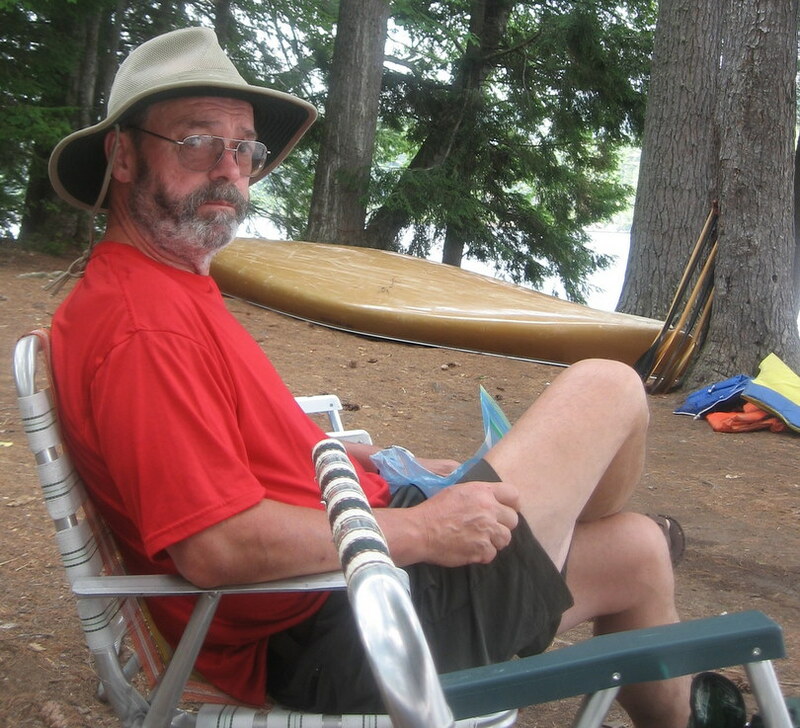 Bob had been told that with the wet summer conditions there was enough water flowing in the outlet that one could mostly paddle to to Ochre Pond and avoid the 7/10 mile portage. I am always willing to drag over a couple of beaver dams to avoid a long carry. From Ochre Pond we had a 1.4 mile carry into Fish Pond. This was a killer, mainly due to expectations. The carry route is interesting, up and down along an esker that extends into Fish Pond, but the carry continues long after one sees Fish Pond on both sides of the esker. I was expecting to be able to drop the canoe into Fish Pond, but noooo….. must carry more. We were all tired and thirsty at the end of the double carry. 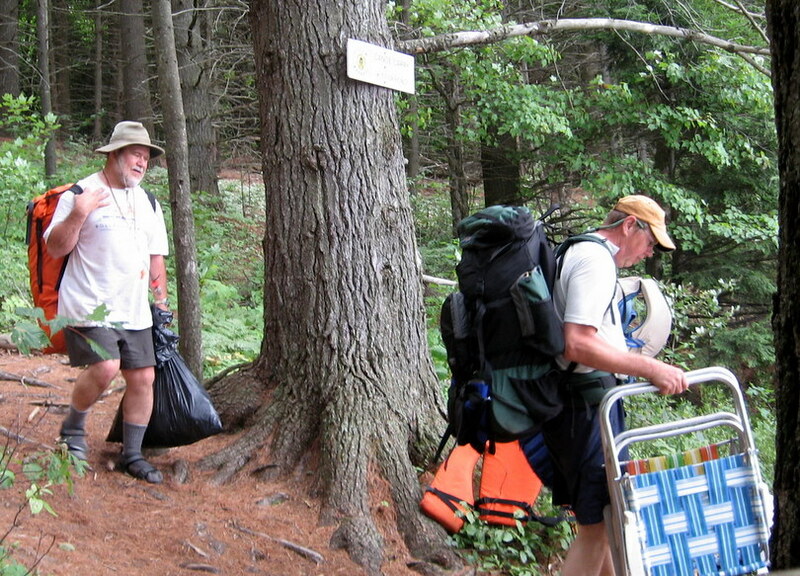 Below Bob carries a food pack and the growing garbage bag while I carry our backpack, life jackets and lawn chairs. 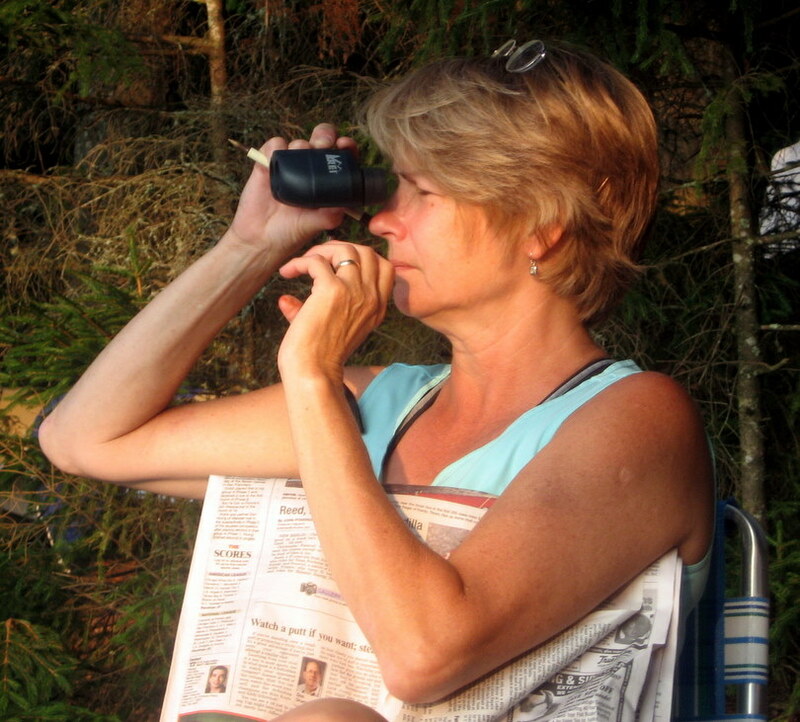 We camped that night at the lean-to on the north shore of Fish Pond. After a swim we had a wonderful one-pot pasta meal inspired by Tamia Nelson’s “In the Same Boat” article on Paddling.Net. A word about our cooking arrangements, if I might. Bob is a wonderful cook. We usually pre-agree that we will each do our own breakfast and lunch meals and Bob cooks dinners. In exchange for dinner we set up tents, cut wood, wash dishes and do pretty much all the other camp chores so Bob doesn’t have to. Our meals included franks and beans, pork and sauerkraut, and vegetable pasta. For some reason Bob’s one pot vegetable laden pasta really hit the spot that night. The basic recipe was to mix sauce and water together, break the pasta to ensure it gets covered and then, in this case, add vegetable soup for extra veggies and flavoring. Yum. Thanks Bob! 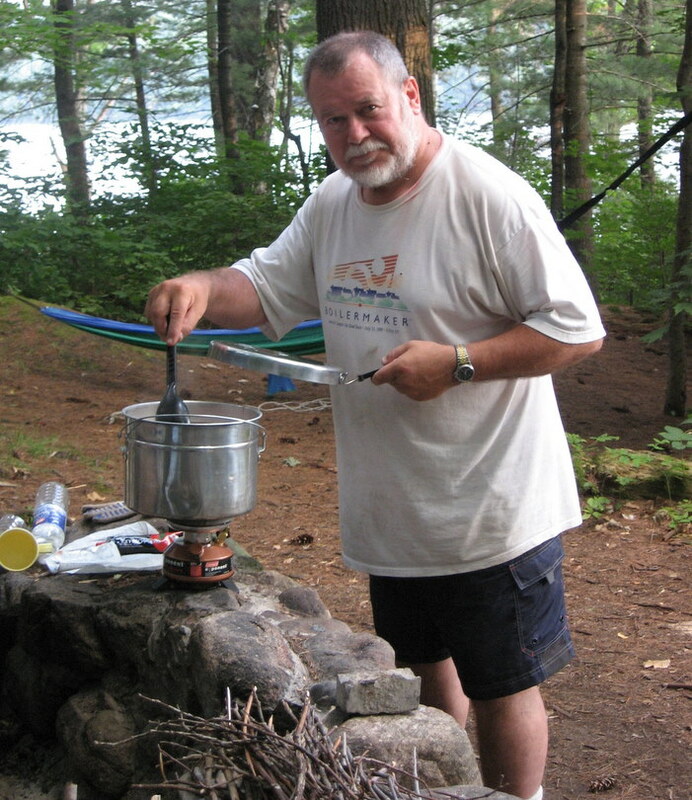 In addition to Bob’s meals we brought along our Backpacker’s Oven and made each day we made blueberry, corn meal and triple berry muffins or brownies. It was a nice treat. It was at this campsite that Kathryn and I heard Barred Owls the most clearly. They were so close we could hear a long purr at the end of their call, “Who, Who cooks for you, purrrr?”. It was the loudest and clearest owl call I have every heard. Very cool. Wednesday morning after a brief sprinkle we left Fish Pond. 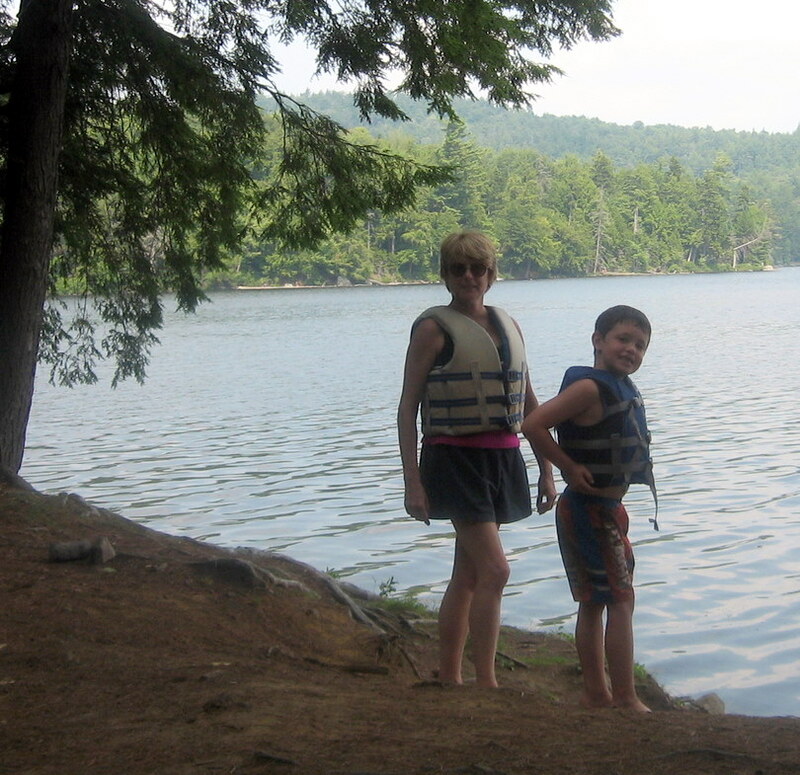 Our plan was to journey down to Bessie Pond and examine the campsite there. 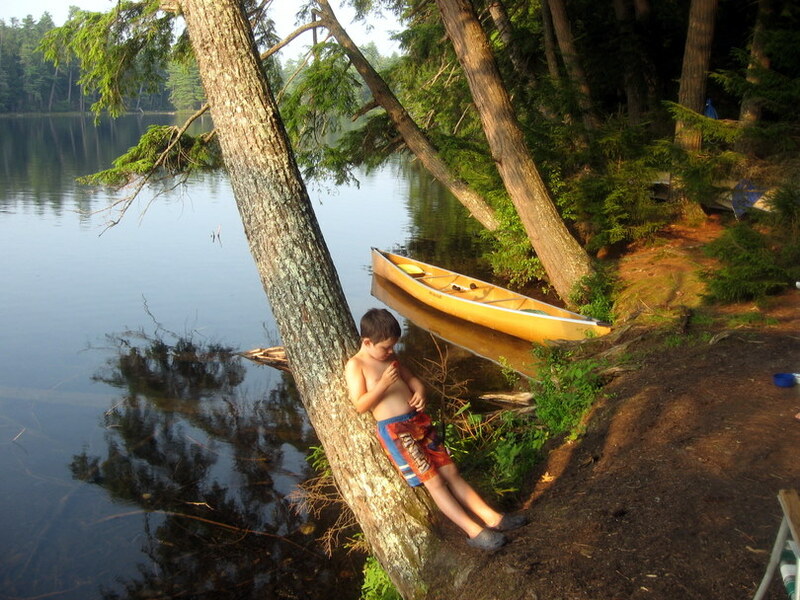 If it met our basic criteria; clean, enough room for two tents and decent swimming opportunities; we would stay there and then do the 1.6 mile portage to Long Pond the next day. We were disappointed to see the Bessie campsite trashed. The fire pit was still smoldering with food wrappers and fiberglass tent poles in fire. There were Jolly Rancher candies and AA batteries scattered around the site. There was toilet paper and excrement on the ground near the campsite. There was a tarp and some cooking pots stored under an old picnic table, probably left by other campers. 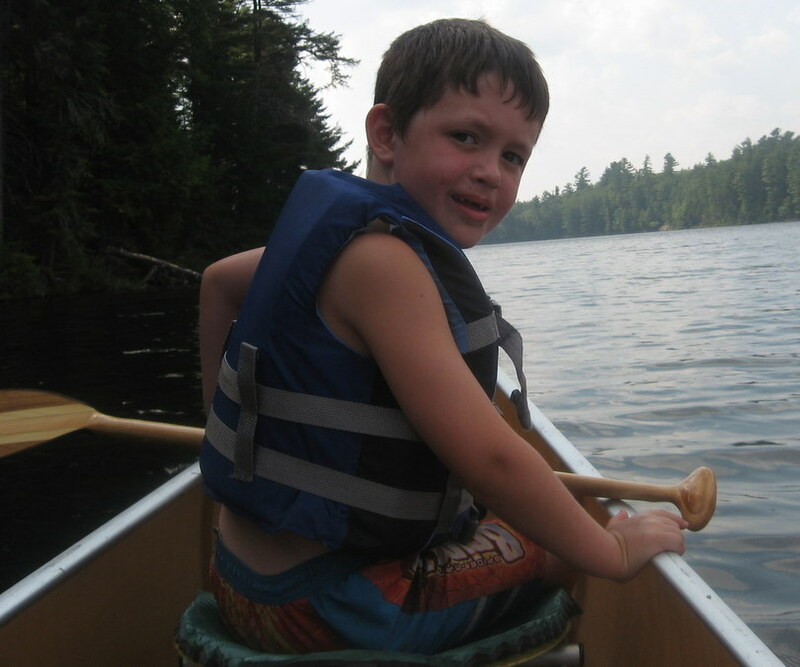 We picked up the most toxic items (batteries) to pack out and hoped that we would be able to confront the pigs that left the mess on our portage to Long Pond. Unfortunately we did not. Later we unsuccessfully checked the trail register in the parking lot for anyone signed into Bessie. We did encounter an Assistant Ranger the following day and told him about the situation. 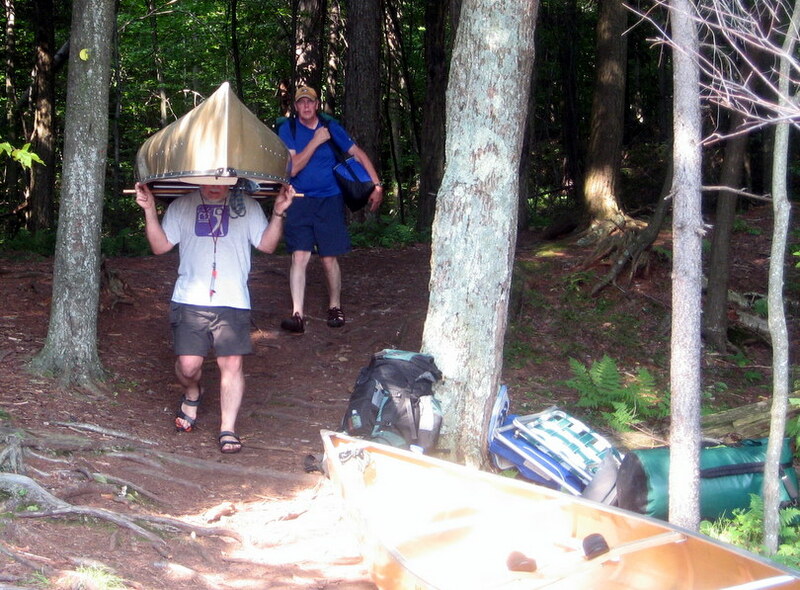 Back to the 1.6 mile portage…..in a break from previous portages we decided to use a leapfrog approach; carry the canoes part way down the trail, drop them and return for gear, bringing the gear to the previous drop spot and then move the canoes the next increment along the trail. This worked great. The 1st 5-10 minutes of a canoe carry go easy. Then there are 5-10 minutes of it becoming a chore. Finally you enter the “why am I doing this” zone. Mentally it was easier to put a canoe up and say to oneself “I only need to do this for 15-20 minutes”. Other than Skip leaving his Nalgene water bottle at the 1st stop, the trip quickly proceeded in three increments and we were at Long Pond before expected. At the put in we encountered a couple from Indiana who were going up the trail on a hike. We talked about trail conditions and where to find blueberries. They told us they had a blueberry cheesecake set into a pot which was cooling in the lake and if Eric could find it he could have a piece. Naturally that sparked Eric’s interest and he was determined to find a pot along the lake shore while we were more interested in finding an open camp site. We gave them our trail description and told them about the Bessie Campsite and the lost water bottle. The following morning they came across our campsite as they were paddling out and we were finishing breakfast. They had found and returned Skip’s water bottle. 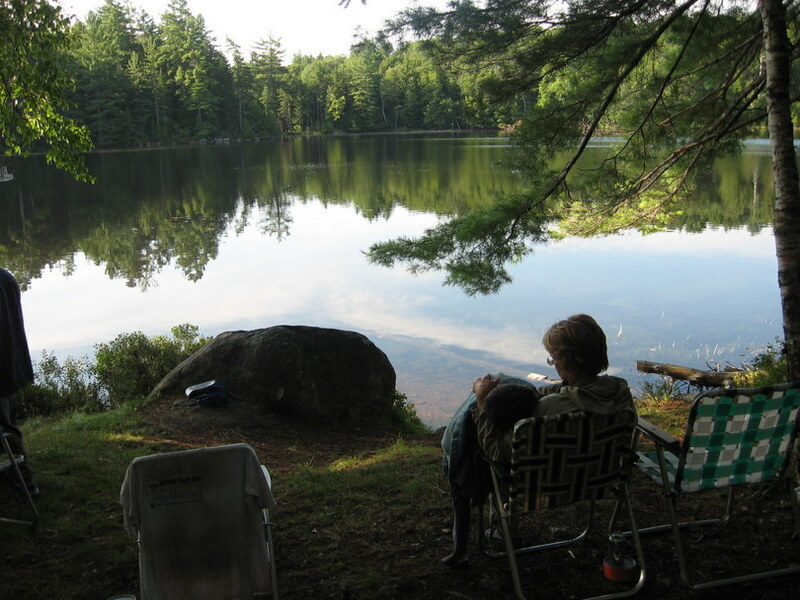 Once on Long Pond we checked out a couple of empty campsites and settled on the one Skip & I had used last fall when we did a scouting trip to St Regis/Long Pond. It was a nice site with white birch trees, good swimming and it was clean. That night we skipped a formal dinner to finish up all our snacks: nuts, cheese, pepperoni, summer sausage and bagels made a nice treat. 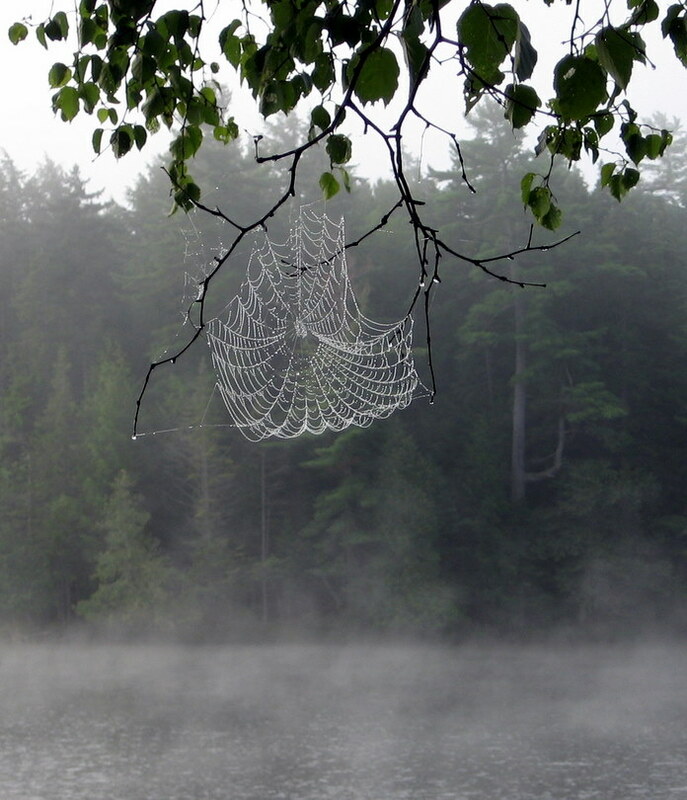 The next morning was foggy and the trees were draped with visible spider webs. A note about our water purification system. 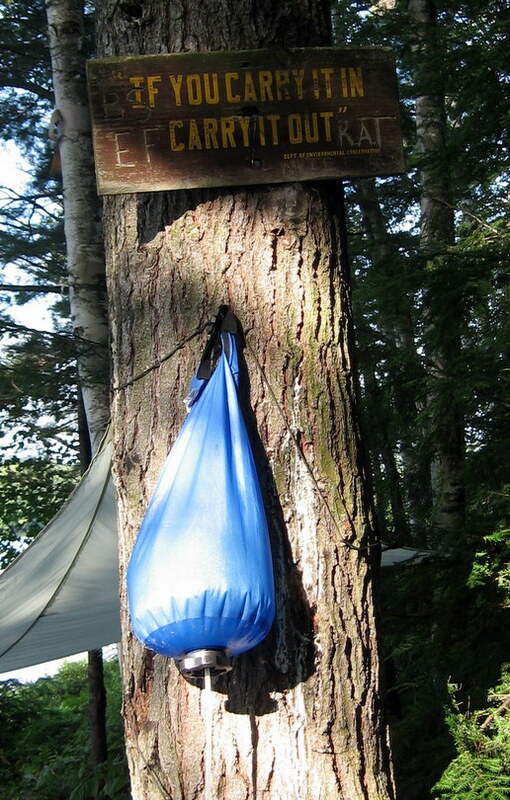 At each campsite I would scoop up water in our collapsible water bucket and filter it through a bandanna into the Katadyn Base Camp water filter which we would hang until departure. From here we would fill our cooking pots and water bottles as needed. If we needed more water during the day, Bob carried a Steri-Pen to cleanse individual Nalgene bottles. Kathryn brought along crystal light and tang to mix with the drinking water and Eric carried his own water bottles and did a good job of keeping hydrated. Usually mornings Skip, Bob and I were the 1st to awake and get the hanging food bags, make coffee and watch the morning. Kathryn would follow shortly and Eric was the last to arise. Below Eric wakes up slow and snuggles in Kathryn’s lap before breakfast. After breakfast we began the process of packing up and paddled across Long Pond to our takeout car. While left in the parking lot someone scraped against Kathryn’s car and relocated the tail light such that the hatch back couldn’t open. This made loading the car a little more problematic (not to mention the $200 repair bill). Kathryn, Eric and Skip reversed the car shuttle process to retrieve Skip’s Outback from Upper St Regis as Bob & I played Sherpa and moved gear from the Long Pond access to the parking lot. It just began to rain as we were loading the canoes on the car and it rained most of the way home. Perfect timing! Kathryn, Eric and I stopped at the McDonald’s in Tupper Lake for hot, salty, quick food, while Bob & Skip stopped at the Hard Rock in Eagle Bay for something more thirst quenching. We got back in time to shower, change our clothes and attend the year end volleyball awards party. The following day, Friday, was spent washing clothes, unpacking, and cleaning the camping gear. This was a nice trip despite our conflicting objectives. Our goal of a leisurely comfort trip (chairs, books, baking oven, etc), conflicted with our desire to do the 11 carries route and traverse the longer portages. We really thought we would spend two nights at the same site, but Fish Pond wasn’t as spectacular as we had thought. Our weather was ideal, couldn’t be better – except maybe cooling off more at night, but that is a quibble. No one suffered any cuts, scrape, dings, or missing fingers. Eric helped out on the portages and did great for being 6. All in all a nice trip.